These are keto homemade chocolate chips that easy and delicious. 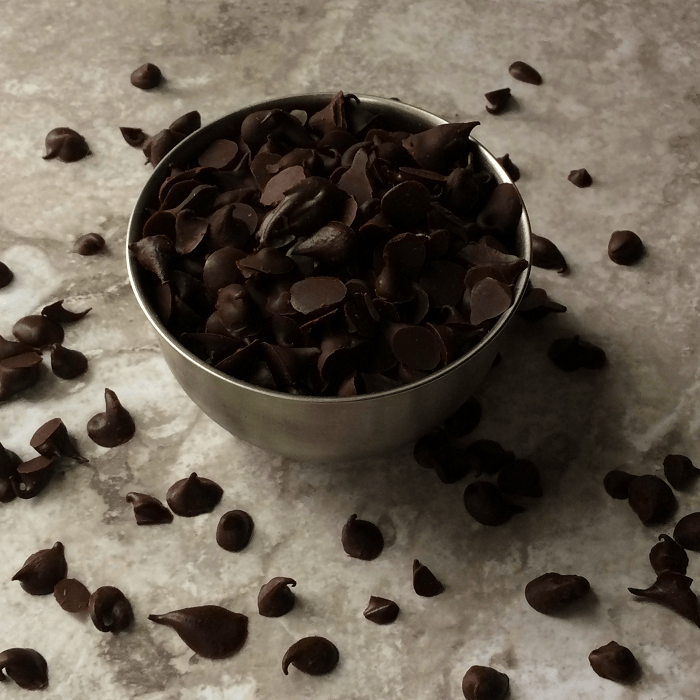 You may never buy chocolate chips again. Melt bakers chocolate in a microwave-safe bowl in the microwave at 30-second intervals. Stir after each interval until melted. You could also do this in a double boiler. Add hot melted butter to the bakers chocolate. Your chocolate should be smooth and glossy. I did not put how much stevia to add because different people have different tastes. What may be too sweet for one is not sweet enough to someone else. So add some stevia, taste, and add more if needed. Push chocolate down to the bottom of the piping bag or to one of the corners of the sandwich bag. Snip the corner of the sandwich bag if that is what you are using. On a parchment lined cookie sheet pipe out chocolate chips in rows. You will need to work quickly so that the chocolate does not start to harden. If the chocolate hardens too much to work with, you can put the rest into a bowl. When it hardens up the rest of the way just break it into chunks. I have not had it harden on me but just wanted to put that in here. Don’t heat up the chocolate and then walk away because it will start to harden in the bag. To get a good looking chip, tap the bag (or piping tip) onto the cookie sheet and pull back up it a swoop motion. Pipe all the chips until the chocolate is gone. Place cookie sheet in the refrigerator or the freezer until chips are set. About 5-10 minutes. You can now peel the chips off the parchment paper and use as you would normally use chocolate chips. If you are not using them right away, place them into a bowl with a lid or just into a sandwich bag. They will be fine at room temperature, but just in case I like to store them in the freezer. They don't freeze together and I do not run the risk of them melting together. Yield: ½ cup of chocolate chips.